Break out your produce baskets and make room in the fridge: our pop-up markets are bringing farm-fresh fare and locally made goodies to Anthropologie stores from coast to coast and you, friends, are invited to join us. See the full schedule of upcoming marketsfrom Portland to Houston to Cambridgebelow. We hope to see you there! 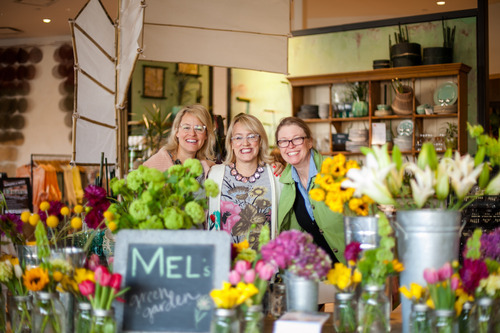 ‚ ‚ ‚ ‚ ‚ ‚ ‚ ‚ ‚ ‚ Smiles and petals at our Madison, WI market.‚ Photo by Laura Zastrow. Saturday, August 2‚ |‚ 11 a.m. 3 p.m.
Saturday, August 9‚ |‚ 12 4 p.m.
Saturday, August 23‚ |‚ 10 a.m. 2 p.m.
Sunday, September 7 |‚ 11 a.m. ‚ 3 p.m.
Saturday, September 13‚ |‚ 10 a.m. 2 p.m.
Saturday, September 13‚ |‚ 11 a.m. – 3 p.m.
Saturday, September 27 |‚ 10 a.m. 2 p.m.
We’re always on the lookout for new products and producers to feature at our markets. Have someone in mind? Drop us a note at anthroevents@anthropologie.com.